Sure, his brother Doug got all the chicks, but Larry Henning was something of a magician too. 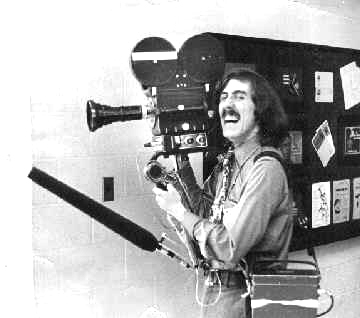 With his 16 millimeter film camera, Frezzolini power pack and ever-present grin, Larry could turn a high noon ribbon cutting into a six o clock lead before you could say “Hey, that ain’t Gallagher!”. Sadly though, Larry also shared his brother’s penchant for stagecraft and invention. Preferring to work alone, he devised his own crotch-mounted microphone, thus eliminating the need for an accompanying soundman. All was well (if not a little awkward) until one summer day in 1971, when the affable photog attempted to profile a rather vile chapter of the Hell’s Angels. Spotted sauntering into the motorcycle gang’s favorite bar with his trademark recording device fully erect, the 32 year old photog was never seen again. Needless to say, the crotch-microphone never caught on. For the longest time, still photojournalists loved to talk smack about the TV lenslingers that would often get in our shots. But as newspaper photojournalists transition to shooting video, they should realize our TV brethren have something to teach us. I think too many of us believe, as we’re huddled in our supply closet video editing suites, that we’re actually inventing a new way to tell a video story. The fact is, the cream of the TV shooter crop, has done this for decades. Damn, I like this guy and not just because he repeatedly uses the term ’lenslinger’ (Oh, how I hope my little word one day ends up in a dictionary!). No, I like Mr. Mulvany because he recognizes that, despite a highly flawed broadcast model, most TV news shooters are skilled storytellers with more passion than paycheck. God knows it’s easy to pick on TV News: trite writing, shallow coverage and a penchant for pretty people make us ripe targets for the pointy-headed set. But if newspaper people are truly serious about rewriting the rules of video, they’d be smart to set aside their aspersions and take a long hard look at what TV news does well. You wanna bag on our hyperbole? Take it upstairs. You want to pick the brains (and beat the pants off) of folks who are committed to the moving image? Talk to the photogs. 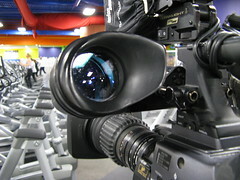 Or better yet, visit NPPA or b-roll TV and see what our very brightest consider their best. Oh yeah - thanks, Colin. Now get outta my shot! 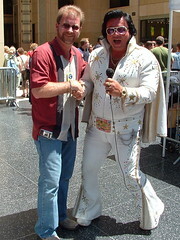 For the longest time, I held no opinion of Elvis Presley. By the time I was born in 1967, he was no longer the rockabilly lothario who set the world on fire. Instead he was the puffy star of countless feckless films, a living legend surrounded by sycophants and increasingly agog on barbiturates. When he died ten years later, I was far more into the Thin White Duke than some pasty has-been in a white satin jumpsuit. As a generation’s longing transformed into a near deity, I rolled my eyes and absorbed hours of a newfangled invention called MTV. As I grew older, my musical tastes matured and I embraced everything from Jethro Tull to Oingo Boingo to The Isley Brothers. But Elvis Presley? Naah, Billy Idol, maybe - but not Elvis. That attitude lasted for thirty years or so and I learned to lead a full life withOUT the late Mr. Presley‘s influence, thank yew very much. But then I did it. I picked up a copy of Last Train to Memphis, Peter Guralnick’s justly acclaimed biography of Elvis’ early years. By the time I finished all 488 pages, I was so hooked on The King I rushed out and bought the second volume, a 661 page treatise on Presley’s spiral into madness. It’s all there, from Elvis’ high school days as a pimple-ridden outcast to his dizzying ascent to music royalty to his latter-day penchant for police flashlights as fashion accessory. Elvis was as insecure as he was talented. In the end he was addled by pills, enabled by his supplicants and the lifelong victim of a svengali in a pork-pie hat.. So please join me in toasting The King on what would have been his 72nd birthday. The pills, the groupies, the peanut butter, the karate, the ranch, the motorcycles, the gurus and the hangers-on … I can’t recommend it with any degree of certainty. But I now this: Had the world and ALL its sundry temptations been laid at my 21 year old feet, I would have gone batshit too. Though I probably would have skipped the jumpsuits. Take the dude walking in circles by the medicine balls. The one in the unitard. He’s been waiting to flex on-cue every since you struck up the fancycam. At the very least act like you’re rolling. Dude’s got bolts comin’ out of his neck. Me, I prefer the la-dees. Like Granny over there. Sure as I’m shootin’, she’s here on doctor’s orders. Probably blew out a hip. She’s can’t even see your lens what with her bifocals all fogged up, but ya gotta dig her moxie. Who knew a woman of that age could squat like that? Over there, by the juice bar. That’s Melton. He’s the janitor. Usually he mops up, but sometimes he just stops and stares like that. His bosses told him the news was coming and now he wants to give you an official tour of the mens locker room. Check out the cat lady. The one wiping down that torture bench with a dishrag she fished out of her junk drawer. She’s…glistening. And oblivious to the social scene going on around her. You know, you don’t see many orange felt pajamas like that in the naked city. That dude grunting like a pig over by the free weights is gonna bust a blood vessel. Either he’s showing off for us or his steroids prescription just ran out. Either way he’s good TV so get him before he passes out. Besdies, I haven’t seen wrestler pants like that since the Fall of ’87. Hey, is that a fanny-pack? The Moms on the treadmills are on to us. Actually they been clocking our every move for the better part of The View. You can travel the galaxy and not find a creature less willing to be televised. And here you and your camera invade their only sanctuary. Quick, get the wide-angle lens! Don’t look now, but that lady with the face is looking over here again. Her - on the elliptical. Yes, the one touching up her mascara . I don’t know how she stays up there either, but one thing’s for sure: She spent a half hour getting dressed for her work-out. Point the damn camera her way or she’ll follow us to lunch. Remember, we’re in a marked car! Ooh, a clipboard. New member. Yep, anytime you see some track-suited no-neck totin’ a clipboard, you can bet there’s a ninety pound weakling following closely b-e-h-i-n-d … there! That Lord of the Rings t-shirt, those oddly knobby knees -- he’s clearly mortified to even be here. Let’s see if he’ll talk! Bright lime-green ain’t exactly my color, but I’ll gladly work it into my next ensemble if it’ll help me get home at night. While not everyone’s convinced it will, I’m err on the side of safety and embrace the use of reflective yellow and shiny piping on the evening news. 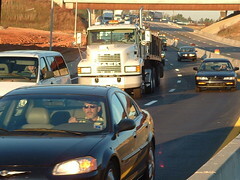 See, a new Federal Highway Administration regulation goes into effect in November (November?) requiring all ‘workers on or near public highways to wear high-visibility safety clothes’. 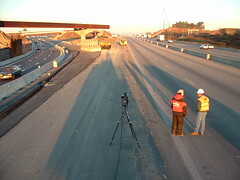 ‘Workers’ now includes media crews -ya know, those poor saps dispatched to the edge of some screaming interstate so they can set up lights and camera and warn everyone watching at home about distracted driving? It’s a thoroughly asinine practice, but long ago image consultants convinced station owners that LIVE(!) meant good. Over-coiffed news readers have been manning crumbling road shoulders and pitch black holes every since. 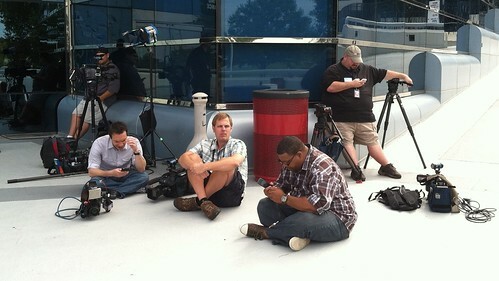 Until the very last live truck is replaced by a shiny, floating laptop, this ill-advised tactic will no doubt continue.